New York health has been the subject of lot of attention recently but no one’s talking about how shale gas is already IMPROVING the health of New Yorkers. A recent comment on our blog motivated me to do some checking on the current health status of New York State, the Governor of which seems to think fracking is what he ought to be worried about. What I found was that the state ought to be looking in the mirror first. Those stats are pretty stunning for anyone with a child suffering from asthma. New York State has super-high asthma emergency room visits for children aged 0-4 years and the rate keeps going up. 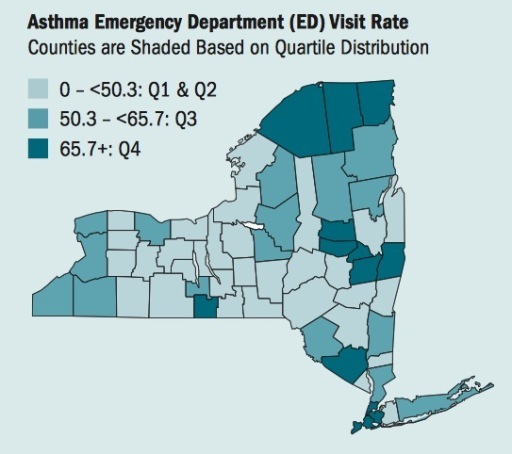 Compared to the 2005-2007 time period, the most recent data for NYS (2009-2011) showed an increase in asthma emergency department visit rates for all age groups, ranging from 3% to 7%. NYS asthma emergency department visit rates were higher for all age groups when compared to the nation. NYS asthma emergency department visit rates were also higher than the Healthy People 2020 objectives for all age groups, especially among children aged 0-4 years (Table 4-1). New York City residents had crude and age-adjusted asthma emergency department visit rates (129.6 per 10,000; 135.0 per 10,000) in 2009-2011 that were approximately 2.5 times higher than residents in the Rest of State (50.9 per 10,000; 54.2 per 10,000). From 2003 to 2010, current asthma prevalence was inversely proportional to annual household income. In 2011, current asthma prevalence was highest for adults with annual household income levels less than $15,000 (17.2%). Adults in households with incomes of $75,000 or more had the lowest prevalence (7.4%). The map indicates there are some other pockets of higher asthma rates, including, for example, the North Country, where Census statistics on house heating fuels indicate they burn a lot of wood. Western New York has also had coal burning power plants that no doubt impacted things there, but the one in Dunkirk has recently shifted to much cleaner natural gas, so we can expect to see improvements there going forward. New York City can also be expected to see improvements and provides a laboratory for illustrating why the state should be favoring shale gas development as a method of reducing air pollution and asthma rates going forward. The city has had the highest asthma rates because, among other reasons, it has traditionally generated most of its heat and power using coal and heavy fuel oil. Mayor Bloomberg set out to change that several years ago and succeeded. Health Department estimates show that each year, PM2.5 pollution in New York City causes more than 3,000 deaths, 2,000 hospital admissions for lung and heart conditions, and approximately 6,000 emergency department visits for asthma in children and adults. 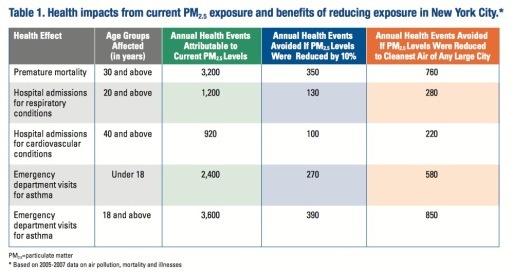 A modest reduction of 10% in current PM2.5 levels could prevent more than 300 premature deaths, 200 hospital admissions and 600 emergency department visits annually, while attaining the goal of “cleanest air of any big city” would result in even greater public health benefits (Table 1). The cleaner air enjoyed by New Yorkers today is preventing 800 deaths 2,000 emergency room visits and hospitalizations from lung and cardiovascular diseases annually, compared to 2008. In 2005-2007, it’s estimated that PM2.5 levels in New York City contributed to over 3,100 deaths, over 2,000 hospitalizations for cardiovascular and respiratory disease, and 6,000 emergency department visits for asthma annually. Today, because of the significant improvements in air quality, the health department estimates that 800 lives will be saved each year and approximately 1,600 emergency department visits for asthma and 460 hospitalizations for respiratory and cardiovascular issues will be prevented every year. The City expects further improvements in air quality and the future health of all New Yorkers as buildings continue to convert to cleaner fuels over the next several years. That’s the story Howard Zucker never considered; how natural gas conversions (and virtually all of NYC’s natural gas supply today is tracked gas from shale in nearby Pennsylvania) have contributed to real tangible health gains for New Yorkers and how more inexpensive shale gas development within the state would not only continue the progress but make it sustainable by equipping New York with its own supply. But, City residents aren’t the only ones who benefit. The State Asthma Surveillance Report also noted the relationship between income and childhood asthma rates, which is no coincidence. Health outcomes are always better in areas with stronger economies and among households with higher incomes, because income increases access to health care for everyone regardless what system is used to deliver it a point that is manifest in the data from the Barnett Shale region. Yes, money is what it takes to deliver high-quality health care and while money doesn’t grow on trees, it is found in rocks such as the Marcellus and Utica Shales and Upstate New York has both. That Upstate New Yorkers are prevented from harvesting natural gas that would mean higher incomes and better health care for them while delivering clean natural gas to save lives in New York City is a damned shame. 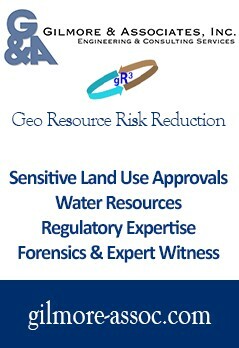 That it was done for the shallowest of political moves on the basis of the shoddiest junk science is a damned crime.